Academically Melvin played by OC Ukeje is behind at school. He is 11 years old and his brother who is 4 years his junior is surpassing him. His stepfather Emeka does not wasn’t to deal with him and so implores his mother to send him away. To save her marriage to Emeka and rid her of the unpleasant memories of Melvin’s father Desmond she sends Melvin to go and live with his grandmother. Melvin and his grandmother, played by Joke Silva grow to be very close. They live alone and together take care of one another. Grandma showers Melvin with care, attention and unconditional love and vice versa. It is a relationship different to the one he experienced with is mother where the love appeared to be conditional upon him excelling in school and in turn being accepted by her husband. Melvin’s grandma suffers with chronic asthma and her frequent attacks mean that he is forever racing up and down to collect her medicines. It is during this time that his formidable running speed is spotted and he is asked to join the state track team. For the first time in his life Melvin is valued and he gains the attention of Norlah (Rita Dominic) a beauty on the track team. Round of applause for grandma. She spoke well. In this movie we see the importance of patience, nurturing and supporting a child. As the saying goes, “not all fingers are created equal.” Melvin was an indiviaual, because he was not as gifted academically as his brother, does that make him a less worthy candidate to love? We see that he is talented but in a different way, athletically. He is so talented as a sprinter that is is he that is sought out to represent the state. When his grandma was patient with him he became more comfortable within himself and was able to excel. The goldfish dying was symbolic of the evaporation of the presence of loneliness in Melvin’s life. The death happens around the time of Melvin’s deepening friendship with Norlah and on the same day that they share their first kiss against the backdrop of the beautiful and formidable waterfalls. I didn’t like the fact that when Norlah shares her first kiss with Banji as the sun sets the backdrop was just as magical. I felt that it dhould have been less so so as to cheapen their relationship. We see how Melvin’s relationship with Norlah gives him motivation and a greater selnse of self esteem and confidence. As their relationship grows he is visibly happier and stops making all the mistakes he previously made. From this we can see that patience, love and understanding can make all the difference in a person’s character. His mother didn’t take the time out to put in these things to nurture him into the man that he does become. I thought OC Ukeje played the role of Melvin excellently. He completely immersed himself in the character. I loved his show of vulnerability. It felt so real. As a viewer I was totally feeling for Melvin. It was heartbreaking to see him not only rejected by his mother and step father, but then to be bullied by the boys on the track team. I badly wanted him to get with Norlah to ease his loneliness and make up for all that he had been through. So you can imagine my horror when they got closer and then are wrenched apart through Banji’s doing. OC Ukeje nailed his role and Melvin the rejected loner with a big heart. Why have I not seen this guy in anything since? Casting directors should be killing themselves to cast him in their movies. Unbeliveable! We all know she is a great actress but I thought she was miscast for this role. She did not look one bit like a professional athlete to me. There was not enough muscle tone on her. They should have either trained her up or got someone else to play the role. Another thing I noticed was the heavy make up all the time, granted it was very natural but it took away from the realism. How are you going to have been attacked the night before and then turn up to training the next day with mascara, foundation, lipstick and eyeshadow. Who goes to an intense training session where you know you will be sweating heavily, with a face full of make up? They tried to show that she has been attacked with the tiny plaster at the corner of her mouth. Na. It wasn’t enough. The tension was electrifying when Rita notices the picture she took of Melvin on the night she was attacked on her dresser. Melvin is unaware that anything is wrong and Rita remainds silent, the shock and bewilderment all over her face. The music is very effective in this scene at heightening the drama of the situation withough being overbearing or taking away from Norlah’s silent stance. Rita loves saying BLOODY I’ve noticed. I wonder if they wrote those lines in for her or she just adds the bloody’s herself! I wondered why Norlah chose not to say anything about the picture of the dresser and continued to be just as friendly to Melvin without reservation. Was it because she simply dismisses from her mind that it could be him? Or could it be that she suspects that he could be involved in the attack but chooses to overlook it because she realises that he has issues and desperately wants to help him. Perhaps his withdrawn and slightly weird behaviour intrigues her as she wants to get close to him all the time even when he is seemingly paying her no mind. The cinematography was beautiful. You could see that every scene was carefully crafted. The way this movie is shot, even a decrepit village has an attractive quality to it. The waterfalls, sunsets, and sunrises were captured and serve to add to the magical quality of the movie. The movie was shot in the mountains surrounding the waterfall Farin Ruwa, in Nassarawa State of Nigeria. Some of the shots were absolutely breath taking. This movie will make you marvel at why you haven’t got on a plane and taken a trip to Farin Ruwa already, or like me never even heard of the place before. I thought the soundtrack was beautiful and simple. The music played at the appropriate times and was consistent throughout… perfect. The scene where Melvin leaves his mother to go and live with his Grandma is very poignant. The camera pans in on Melvin’s face and his eyes are wide and tear filled, we hear the strumming of a guitar while Melvin and his grandmother walk in the rain under an umbrella that shields them both. I thought the rain was representative of his family and the suffering he endured and the umbrella representative of his grandmother who had come to act as protector. It is an emotional scene. Sad because a boy has being rejected by his mother but joyous because we know that he will be happier with his grandmother. How did Melvin get that picture on his dresser? Why would the team let him back on when it seemed that he was the attacker? That would not have been fair to Norlah, not to mention traumatic. At the end Norlah had broken her leg but why is she managing to jump up and down like a Kangaroo when Melvin wins at the sports festival? Nolly this must be new year, new resolution on your rating lol. This is a must for me to watch, 95% ke! I have never seen you rate any movie this high, not even silent scandal or guilty pleasure…. Hmm thanks anyway I will definitely get back to you soon on it. I wish u a prosperous new year and this is our year of RESTORATION! LOL Jumoke! No I'm sorry no New Years Resolution. If the movie is good, bad or horrible it shall be rated accordingly, whatever time of year it is!!! I actually have rated others as high, its just not an occurence that comes aorund that often. Happy new year nolly happy to see you with 95 upgrade seems that this year is going to be excellent and wonderful…So happy for that i will try and get the movie and watch..
To you too Nonso… lets hope this year is a better one in terms of Nollywood Productions. However I still have a few more 2009 movie reviews to post and it aint all good! Happy new year nolly i will get the movie and watch.. I saw the movie a while ago and i absolutely LOVED it! gave me goose bumps as i watched it and melvin is so fine. love joke silva. I try to watch AMBO winner movies every year co they are really good. I can say AMBO really does discover stars and yeah, I can't believe I haven't seen him in any other movies,just unbelievable cos he's good.very. happy new year nolly.Please keep us posted. Since i discovered your blog, I always check the ratings on here b4 i watch, so thanx a LOT!!! Thank you TY… Yes Melvin is a hottie indeed… I havent seen the girl that was in Cindy's Notes in anything else either. NF, this was the film that made start watching Nigerian movies. It was excellent. I agree with your analysis and questions but for me, I just loved the soundtrack. When I watch most nigerian movies, I just think the musicians who do the sound track should be shot…seriously! Producers can learn a thing from Izu Ojukwu's art here. Look at the diversity of the actors, my kids that are very british loved that guy with his massive slang. Or was it the girl that mimicked him? Why are other producers not using these actors for goodness sake! They were fantastic. This is a movie where not only the lead actors but the supporting ones gave a superb performance. I really look forward to seeing more from these guys. Hmm Nolly kudos to you for the rating, the movie sure deserves it. One thing I love is the new type of story line, I mean it was absolutely different from the ones we've seen in the past. I enjoyed OC Ukeje's acting, Rita Dominic was great as always and Joke Siver was superb too. I love the choice of music, no interference with the actors/ actress speaking, it was just well done. Kudos also to Izu Ojukwu the producer, in a nutshell it was a great movies, no dull moments. Thanks once again Nolly. happy new year nolly…i saw dis movie a long time ago, n can't really rmb much of d little details…it is interestin dat it gets a 95%…letz see wat d new year holds…cheers!!! But for once we are going to agree . I believe your ratings are on point. Good job Nolly! Ooh have you… Did you stay long? SG we used to agree all the time before they fed you with all this mediocreness and rubbish so much so that you forgot what was good anymore. Remember when you made me watch the stupid film with Van as a prince and Mercy has asthma? I watched a whole hour and then you told me to hang on it starts getting good in part 2? I hope that 2010 brings much better! LOL!!! I agree with your review. Now to answer one of your questions, I think the picture on the dresser was snuck in there by on of the guys who set Melvin up. But what i don't get is, it's Melvin's room right? How come he never notices it? How can something be snuck in your house? Hmm I still don't get it it was smack bang on the dresser. Why didn't he at least notice it when rita was staring at it in shock? thanks 4 rating dis movie.im a big nollywood fan but most films are usu stupid,however,white waters is outstandg.it has its flaws 2 but it deserves an award. im rili emotional & believe me ,i shed tears while watching d movie.it might sound silly but O.C made it so real.i just love hm.izu ojukwu is jst da bomb.i cld watch d movie everyday xcept 4 d fact dat i still cry anytym i c it isnt dat silly?well,kip up d gud job.thumbs up 2 u! 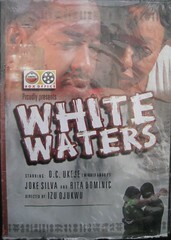 White waters is just 2 great a movie-unlike d typical nollywood movies… OC, my dear Homsuk aka Massive were both 2 good. I wish our producers get to use more of these talented guys rather dan feed us pretty lots dat cant act 2 save their own lives……….. long hiss. Nolly tanx 4 dis rating. You stumbled upon "White Waters" in 2010? This movie was released a few weeks before the 2008 Olympics; which of course was perfectly timed considering the films track & field element. I would have to say that "White Waters" is one of the best Nigerian films I've ever seen. Overall, the film was well done…I commend Izu Ojukwu and your 95% rating. Aight, so all these good reviews, abeg please where can I watch it??? Where do you normally buy your films from? I don't watch Nigerian Movies Online so if that is what you are hinting at sorry I cannot help you! I bought my copy of White Waters from my usual place in London. I just had to make this comment….when am I going to see a movie this good again, the likes of "Cindy's notes"…oh Lord may next year be a great Nollywood year for us all…. "AMEN"
What a great movie. The music at the end was awesome, it brought tears to my eyes. Nolly, i have been searching for this movie high & low, found it on a website today. Would luv to purchase a copy, but no one seems to have it. Great watch. Ohhhhhhhhhhhhh my my my! Since i watched WHITE WATER since 2013, i have been searching for it. It is 101% interesting, nt to mind of some scene that need some question to be asked. Nevertheless, i love the movie, die! Please if any one with the hard copy can help me copy it on a computer and send the file to me via my email. Pls, i love it!